The Scallop fishery within Orkney comprises of both a dredged and dived fishery, with two species found within Orkney Waters; King Scallops (Pecten maximus) and Queen Scallops (Aequipecten opercularis). Scallops are bivalve molluscs with two hard calcified valves.They are found around mainland Scotland, it’s islands, the North Sea and the Atlantic, with limited distribution around the east coast of United kingdom. Typically they inhabit the sea bed from the low water mark to depths exceeding 100m, with habitat preferences ranging from sand, gravel and mud (1). Like all other bivalves scallops are filter feeders, feeding on suspended particles in the water column such as phytoplankton, algae and other micro-organisms. Typically scallops are semi submerged in sediment with the flat valve dorsally placed. Scallops are equipped with numerous eyes and tentacles which are extruded when its valves are open (Fig 1). Scallops are considered generally as sedentary animals but are capable of moving small distances through water propulsion, created by the rapid opening and closing of its valves (1). Scallops are hermaphrodites producing and releasing both eggs and sperm into the water column during reproduction This is done annually each spring or autumn once the scallop is two years old, typically this is done on-mass and synchronized to increase chances of cross fertilization. Once fertilized larvae drift in the water column eventually settling after 3 – 4 weeks and spat attaching itself onto substrate (1). 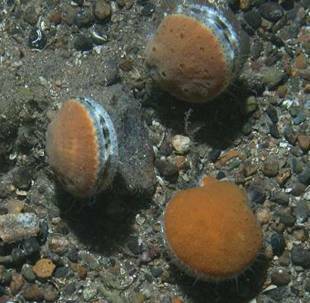 Once settlement has occurred scallops grow continuously until their first winter when growth ceases, after which an annual growth pattern of growth starting in spring and stopping in winter begins. This growth pattern causes the formation of distinct ring on the flat valve caused by annual growth (Fig 2). This allows visual ageing of scallops and subsequent growth and age rate of scallop stocks to be calculated. In Orkney King scallops are an important component of the shellfish industry , with 300 tonnes landed in 2013, accounting for 7% total landed shellfish weight with a commercial value of £767,000, 10% of the total Orkney shellfish fishery value (2). Fishing pressure from the species comes from a combination of divers and a small inshore dredging fleet or approximately 3 vessels, with exploitation occurring around the orkney archipelago (Fig 3). Within orkney there are no species specific landing data for queen scallops, however there known distribution encompasses the Islands (Fig 4). Within the Scottish shellfish fishery queen scallops comprises 10% of total landed weight, with a commercial value of £2.9 million, highlighting it as an important fishery Nationally (2).